Happy Holidays! From our fam to yours, here is the final episode of our first season. Today we name the BEST episode of ATLAB EVER according to science! It’s moody, it’s steamy, it’s got everything you need to keep you warm on those cold winter nights. We hope you enjoy and we’ll see you in the new year for Season Two! You ever wonder what The Best episode of ATLAB is? Wonder no more! We are wrapping up our first season with a bracket extravaganza! In this first part, we decide which episodes we will debate in our finale (which, in true Avatar fashion, will be in two parts). Thank you to all of our listeners and supporters over our first season, it’s been a blast. If you want to see more in Season 2 don’t forget to crazy tweet at us! Yip yip! You ever notice how many prisons are in the ATLA universe? We sure did! Today your resident Three Non Benders discuss themes of confinement, imprisonment vs. capitol punishment, freedom, and the elements. Then we just about how cool some of these jails are in ATLA. We’ve done it. We talked about ships. Water Tribe canoes, Fire Nation airships, and the popular air segway — no, not that… ok… oh right, we actually just fight over who loves each other the most in A:TLA. Join the @3nonbenders team, Rachelle (@rachellephant), Tim (@limtawson), and Marissa as we low key get in a fist fight about Kataang and Zutara. The 3NB (@3nonbenders) squad talks about animals in Avatar: The Last Airbender. Are animals more spiritual than humans? Can Momo see Aang in the spirit world? And what does the wolf imagery for Southern Water Tribe warriors mean when waterbenders are guided by the moon? Join Rachelle (@rachellephant), Marissa, and Tim (+ special guest Tim’s dog) for answers to these and MORE! 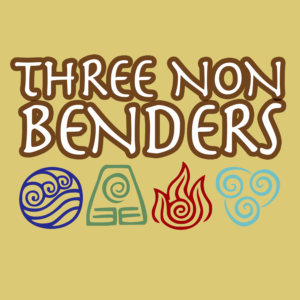 The hosts of Three Non Benders discuss the elements of the Avatar: The Last Airbender world and determine how they are all connected. THE TEASER FOR 3NB IS FINALLY HERE! We have been working so hard on this. Some may say too hard. I would definitely say too hard. But no matter–it’s here! Please enjoy, subscribe, complain, etcetera. @3nonbenders on twitter if you have feelings. See you next week!